The X-Series Actuator doesn’t look like much. Actually, if I’m being honest, it kind of looks like a red metal scotch tape dispenser with ribbed sides and a couple of ethernet ports. The product is scattered all over HEBI’s one-room Pittsburgh office in various states of disarray. The palm-sized metal component is the startup’s primary product — its entire reason for existing, really. The actuator’s unassuming profile hides a lot of impressive technology that has helped make the three-year-old company a rising star in the city’s bustling robotics startup community. 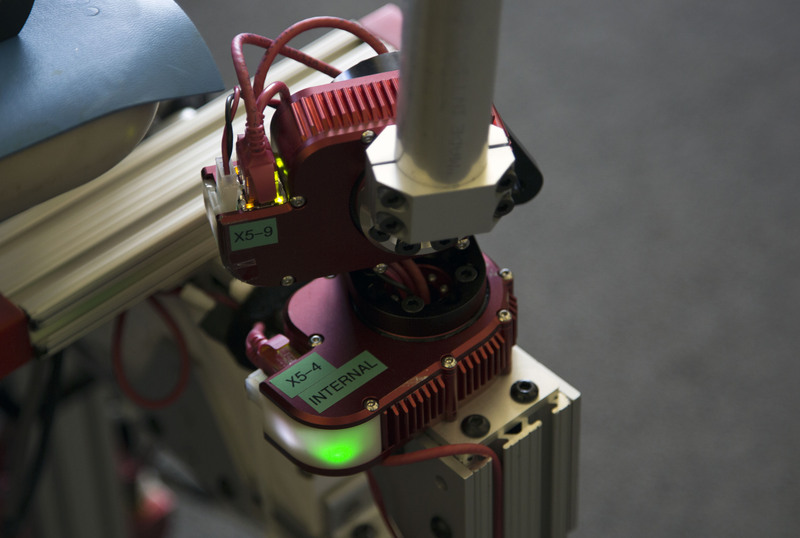 Its capabilities come into clearer focus as you look around the room at a number of wildly diverse robots that use the little red actuator as a sort of connective tissue — a sort of robotic knee or elbow joint. There’s a grasping arm, a milling machine and a few other half-concocted builds that look like robotic rejects from the Island of Misfit Toys. Co-founder Dave Rollinson introduces us to Igor, a strange and skinny robot that balances on two wheels like a Segway. On top of its square frame are a pair of long arms that arc down in an L-shape, each with a circular paddle for hands. With very light controls, the robot can clasp and pick up objects. It’s not the most graceful robot we’ve seen on our three-day trip to the City of Bridges, but it’s a perfect example of how the company’s product can be used to quickly piece together a complex robotic prototype. It’s kind of like an Erector Set for grownups with computer science degrees. The company, like most of Pittsburgh’s thriving robotics community, began life at nearby Carnegie Mellon. 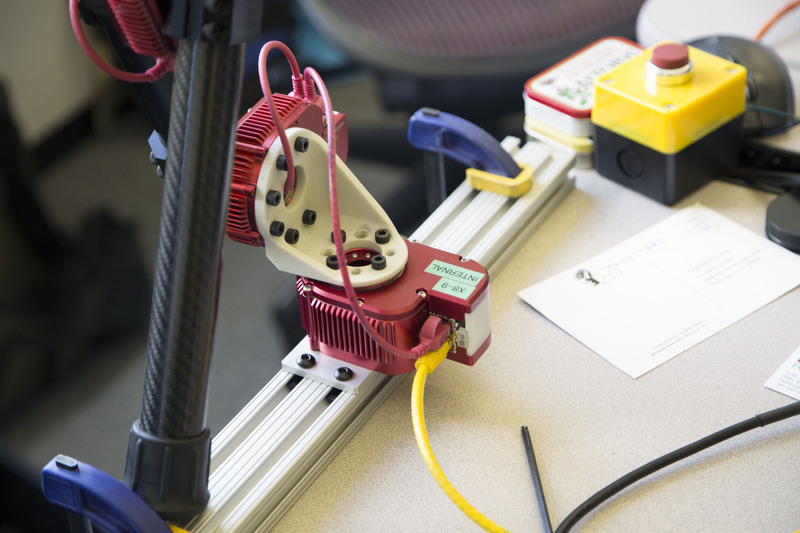 The actuator has its origins in CMU’s snake robot, a modular mechanical serpent that’s proven to be one of the school’s most enduring projects. In fact, we first looked at the ‘bot back in 2008, when it was still in its earliest stages. Since then, it’s proven a diverse and robust project — though, even with the university’s aggressive approach to spinning off startups, it hasn’t been easy to monetize. The nascent company flirted with the idea of positioning it as a search and rescue robot, touting its ability to squeeze into pipes and other tight spaces. Ultimately, however, it was the snake’s parts that gave rise to HEBI. The modules are assembled and tested by HEBI’s eight-person staff. Demand is still manageable, but the company’s LEGO-like approach to robot building has made it a hit in Pittsburgh’s tight-knit robotics community. The sophisticated underlying technologies could eventually wind up in industrial robots, which would benefit from their ability to control force, making it safer for them to interact with factory workers. In the meantime, however, the X-Series is primarily finding success as a prototyping tool. For now, the company’s model is still pretty limited. The company’s limited online distribution model is primarily aimed at startups, universities and research facilities. As cool as it would be to build your own robot at home, you’re not going to be able to go and pick up the actuator at a Best Buy like a Arduino board any time soon. The company’s still limited by size and the product is probably cost prohibitive for your run of the mill maker. If you’re looking to mock up a prototype of a robot for future product, HEBI’s offering may be right up your alley.